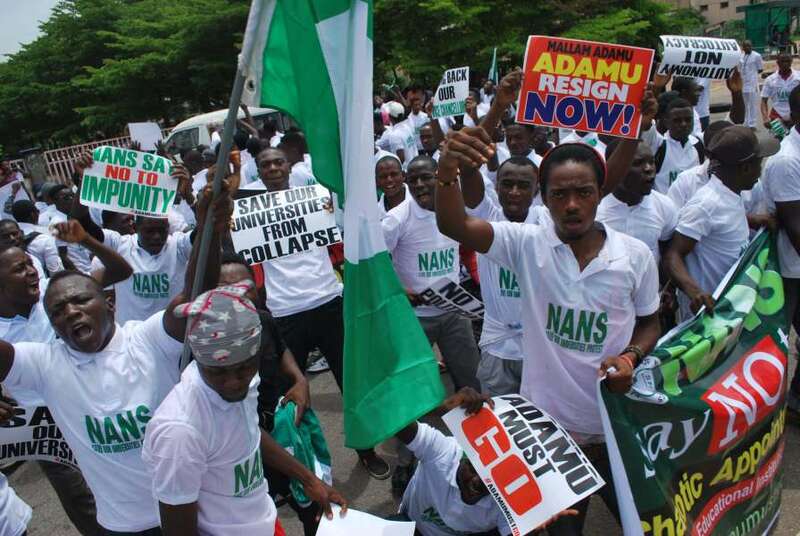 The National Association of Nigerian Students, (NANS), has threatened to boycott and also to disrupt the coming 2019 general elections if the Academic Staff Union of Universities (ASUU), the Academic Staff Union of Polytechnics (ASUP) and the Federal Government fail to reach an agreement and call off the ongoing nationwide strike. NANS Zone B, comprising institutions in the South East and South South, at a peaceful demonstration at the Delta state end of the Niger Bridge, barricaded the expressway to register their displeasure over the lingering strike and also called on the government of Nigeria to either negotiate with ASUU, or forget about the elections. The protesting students, drawn from the eleven states of the South South and South East, were seen wielding placards of various inscriptions. Comrade Okereke Godson, Zone B coordinator said that students could not afford to stay at home while the country holds the 2019 general elections, warning that the umbrella body of the students would chase away voters on the day of elections. “Students constitute 46% of the electoral strength in this country and if the federal government fails to end the strike, we see it as a deliberate attempt to rig the poll because the election cannot hold while we remain at home. Let them open our campuses or election will not hold,” Godson stated.